Each team consists of three to five members, and the winning team is the one whose member has the last intact target on his or her head. Who would not remember playing with water guns on hot summer days when getting a little wet was only welcome as it brought relief from the relentless sun besides being great fun. Everyone can relive those days again, and have a chance to earn a nice prize at the same time during Ginowan Hagoromo Festival on Sunday, Aug. 9th. 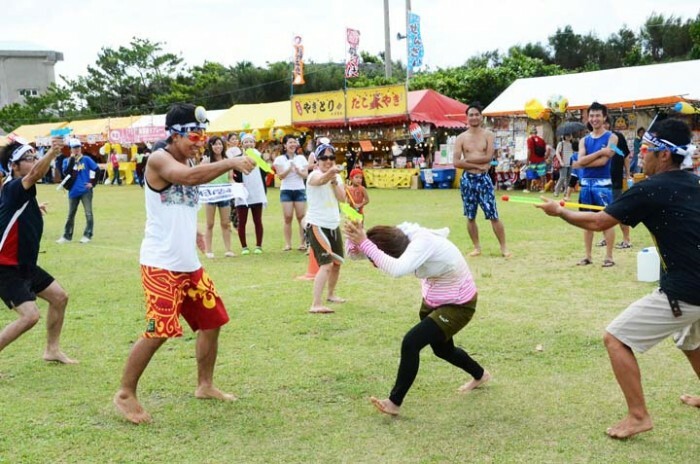 The Hagoromo Festival water gun battle has two categories. One is for general public, and the other for elementary school-age children. 16 teams will battle in each category. For the competition, participants put two paper targets called ‘poi’ on their heads. The targets are like a scooper for goldfish scooping at festivals. The winner is the team whose member’s ‘poi’ remains intact last. The prize for the winning team in the general category for persons of junior high school age and older is a deluxe gift card worth ¥50,000. The elementary school kids compete for a ¥25,000 book store gift card. The participation fee per team in the general category is ¥1,000, while elementary school children’s teams pay ¥500. Teams must register for the competition in advance. The deadline is Thursday, Jul. 30. The teams need to turn in the application sheet to the organizing office by FAX at 098-897-0769, e-mail at mensoreginowan@gmail.com, or in person at Ginowan City Tourism Promotion Association Office at 558-18 Uchidomari, Ginowan..
Each team consists of three to five persons. The number of teams is limited to 16 in both categories. The participants can use only a gun that the organizers prepare, and they must wear goggles or sunglasses during the contest. The competition starts at noon on Sunday, Aug. 9th, and continues until 3 p.m. It takes place at Hagoromo Festival multi-purpose space at Ginowan Seaside Park.